Historic boiler in functioning condition. Photo: NPS files. The need for modern mechanical systems is one of the most common reasons to undertake work on historic buildings. Such work includes upgrading older mechanical systems, improving the energy efficiency of existing buildings, installing new heating, ventilation or air conditioning (HVAC) systems, or—particularly for museums—installing a climate control system with humidification and dehumidification capabilities. Decisions to install new HVAC or climate control systems often result from concern for occupant health and comfort, the desire to make older buildings marketable, or the need to provide specialized environments for operating computers, storing artifacts, or displaying museum collections. Unfortunately, occupant comfort and concerns for the objects within the building are sometimes given greater consideration than the building itself. In too many cases, applying modern standards of interior climate comfort to historic buildings has proven detrimental to historic materials and decorative finishes. This Preservation Brief underscores the importance of careful planning in order to balance the preservation objectives with interior climate needs of the building. It is not intended as a technical guide to calculate tonnage or to size piping or ductwork. Rather, this Brief identifies some of the problems associated with installing mechanical systems in historic buildings and recommends approaches to minimizing the physical and visual damage associated with installing and maintaining these new or upgraded systems. large sections of historic materials are removed to install or house new systems. historic structural systems are weakened by carrying the weight of, and sustaining vibrations from, large equipment. moisture introduced into the building as part of a new system migrates into historic materials and causes damage, including biodegradation, freeze/thaw action, and surface staining. exterior cladding or interior finishes are stripped to install new vapor barriers and insulation. historic finishes, features, and spaces are altered by dropped ceilings and boxed chases or by poorly located grilles, registers, and equipment. systems that are too large or too small are installed before there is a clearly planned use or a new tenant. The dropped ceilings covering an air conditioning system also cover the historic windows, altering their proportion and resulting in loss of the historic character. Photo: NPS files. For historic properties it is critical to understand what spaces, features, and finishes are historic in the building, what should be retained, and what the realistic heating, ventilating, and cooling needs are for the building, its occupants, and its contents. A systematic approach, involving preservation planning, preservation design, and a follow-up program of monitoring and maintenance, can ensure that new systems are successfully added—or existing systems are suitably upgraded—while preserving the historic integrity of the building. No set formula exists for determining what type of mechanical system is best for a specific building. Each building and its needs must be evaluated separately. Some buildings will be so significant that every effort must be made to protect the historic materials and systems in place with minimal intrusion from new systems. Some buildings will have museum collections that need special climate control. In such cases, curatorial needs must be considered—but not to the ultimate detriment of the historic building resource. Other buildings will be rehabilitated for commercial use. For them, a variety of systems might be acceptable, as long as significant spaces, features, and finishes are retained. Most mechanical systems require upgrading or replacement within 15-30 years due to wear and tear or the availability of improved technology. Therefore, historic buildings should not be greatly altered or otherwise sacrificed in an effort to meet short-term systems objectives. The history of mechanical systems in buildings involves a study of inventions and ingenuity as building owners, architects, and engineers devised ways to improve the interior climate of their buildings. Following are highlights in the evolution of heating, ventilating, and cooling systems in historic buildings. Early heating and ventilation in America relied upon common sense methods of managing the environment. Builders purposely sited houses to capture winter sun and prevailing summer cross breezes; they chose materials that could help protect the inhabitants from the elements, and took precautions against precipitation and damaging drainage patterns. The location and sizes of windows, doors, porches, and the floor plan itself often evolved to maximize ventilation. Heating was primarily from fireplaces or stoves and, therefore, was at the source of delivery. In 1744, Benjamin Franklin designed his "Pennsylvania stove" with a fresh air intake in order to maximize the heat radiated into the room and to minimize annoying smoke. 19th century buildings used porches, cupolas, and awnings to make them more comfortable in the summer. Photo: NPS files. Thermal insulation was rudimentary—often wattle and daub, brick and wood nogging. The comfort level for occupants was low, but the relatively small difference between internal and external temperatures and relative humidity allowed building materials to expand and contract with the seasons. Regional styles and architectural features reflected regional climates. In warm, dry and sunny climates, thick adobe walls offered shelter from the sun and kept the inside temperatures cool. Verandas, courtyards, porches, and high ceilings also reduced the impact of the sun. Hot and humid climates called for elevated living floors, louvered grilles and shutters, balconies, and interior courtyards to help circulate air. The industrial revolution provided the technological means for controlling the environment for the first time. The dual developments of steam energy from coal and industrial mass production made possible early central heating systems with distribution of heated air or steam using metal ducts or pipes. 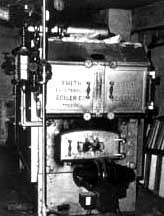 Improvements were made to early wrought iron boilers and by late century, steam and low pressure hot water radiator systems were in common use, both in offices and residences. Some large institutional buildings heated air in furnaces and distributed it throughout the building in brick flues with a network of metal pipes delivering heated air to individual rooms. Residential designs of the period often used gravity hot air systems utilizing decorative floor and ceiling grilles. Ventilation became more scientific and the introduction of fresh air into buildings became an important component of heating and cooling. Improved forced air ventilation became possible in mid-century with the introduction of power-driven fans. 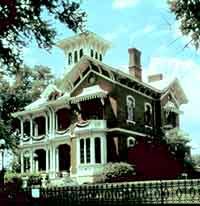 Architectural features such as porches, awnings, window and door transoms, large openwork iron roof trusses, roof monitors, cupolas, skylights and clerestory windows helped to dissipate heat and provide healthy ventilation. Cavity wall construction, popular in masonry structures, improved the insulating qualities of a building and also provided a natural cavity for the dissipation of moisture produced on the interior of the building. In some buildings, cinder chips and broken masonry filler between structural iron beams and jack arch floor vaults provided thermal insulation as well as fireproofing. Mineral wool and cork were new sources of lightweight insulation and were forerunners of contemporary batt and blanket insulation. The technology of the age, however, was not sufficient to produce "tight" buildings. There was still only a moderate difference between internal and external temperatures. This was due, in part, to the limitations of early insulation, the almost exclusive use of single glazed windows, and the absence of airtight construction. The presence of ventilating fans and the reliance on architectural features, such as operable windows, cupolas and transoms, allowed sufficient air movement to keep buildings well ventilated. Building materials could behave in a fairly traditional way, expanding and contracting with the seasons. A return air grille is successfully screened behind the arch. Photo: NPS files. The twentieth century saw intensive development of new technologies and the notion of fully integrating mechanical systems. Oil and gas furnaces developed in the nineteenth century were improved and made more efficient, with electricity becoming the critical source of power for building systems in the latter half of the century. Forced air heating systems with ducts and registers became popular for all types of buildings and allowed architects to experiment with architectural forms free from mechanical encumbrances. In the 1920s large-scale theaters and auditoriums introduced central air conditioning, and by mid-century forced air systems which combined heating and air conditioning in the same ductwork set a new standard for comfort and convenience. The combination and coordination of a variety of systems came together in the post-World War II high-rise buildings; complex heating and air conditioning plants, electric elevators, mechanical towers, ventilation fans, and full service electric lighting were integrated into the building's design. The insulating qualities of building materials improved. Synthetic materials, such as spun fiberglass batt insulation, were fully developed by mid-century. Prototypes of insulated thermal glazing and integral storm window systems were promoted in construction journals. Caulking to seal out perimeter air around window and door openings became a standard construction detail. The last quarter of the twentieth century has seen making HVAC systems more energy efficient and better integrated. The use of vapor barriers to control moisture migration, thermally efficient windows, caulking and gaskets, compressed thin wall insulation, has become standard practice. New integrated systems now combine interior climate control with fire suppression, lighting, air filtration, temperature and humidity control, and security detection. Computers regulate the performance of these integrated systems based on the time of day, day of the week, occupancy, and outside ambient temperature. Although twentieth century mechanical systems technology has had a tremendous impact on making historic buildings comfortable, the introduction of these new systems in older buildings is not without problems. The attempt to meet and maintain modern climate control standards may in fact be damaging to historic resources. Modern systems are often over-designed to compensate for inherent inefficiencies of some historic buildings materials and plan layouts. Energy retrofit measures, such as installing exterior wall insulation and vapor barriers or the sealing of operable window and vents, ultimately affect the performance and can reduce the life of aging historic materials. Complex mechanical systems for institutional buildings may require a central control room. Photo: NPS files. In general, the greater the differential between the interior and exterior temperature and humidity levels, the greater the potential for damage. As natural vapor pressure moves moisture from a warm area to a colder, dryer area, condensation will occur on or in building materials in the colder area. Too little humidity in winter, for example, can dry and crack historic wooden or painted surfaces. Too much humidity in winter causes moisture to collect on cold surfaces, such as windows, or to migrate into walls. As a result, this condensation deteriorates wooden or metal windows and causes rotting of walls and wooden structural elements, dampening insulation and holding moisture against exterior surfaces. Moisture migration through walls can cause the corrosion of metal anchors, angles, nails or wire lath, can blister and peel exterior paint, or can leave efflorescence and salt deposits on exterior masonry. In cold climates, freeze-thaw damage can result from excessive moisture in external walls. To avoid these types of damage to a historic building, is important to understand how building components work together as a system. Methods for controlling interior temperature and humidity and improving venation must be considered in any new or upgraded HVAC or climate control system. While certain energy retrofit measures will have a positive effect on the overall building, installing effective vapor barriers in historic walls is difficult and often results in destruction of significant historic materials. Climate control systems are generally classified according to the medium used to condition the temperature: air, water, or a combination of both. The complexity of choices facing a building owner or manager means that a systematic approach is critical in determining the most suitable system for a building, its contents, and its occupants. No matter which system is installed, a change in the interior climate will result. This physical change will in turn affect how the building materials perform. New registers, grilles, cabinets, or other accessories associated with the new mechanical system will also visually change the interior (and sometimes the exterior) appearance of the building. Regardless of the type or extent of a mechanical system, the owner of a historic building should know before a system is installed what it will look like and what problems can be anticipated during the life of that system. The potential harm to a building and costs to an owner of selecting the wrong mechanical system are very great. The use of a building and its contents will largely determine the best type of mechanical system. The historic building materials and construction technology as well as the size and availability of secondary spaces within the historic structure will affect the choice of a system. It may be necessary to investigate a combination of systems. In each case, the needs of the user, the needs of the building, and the needs of a collection or equipment must be considered. It may not be necessary to have a comprehensive climate control system if climate-sensitive objects can be accommodated in special areas or climate-controlled display cases. It may not be necessary to have central air conditioning in a mild climate if natural ventilation systems can be improved through the use of operable windows, awnings, exhaust fans, and other "lowtech" means. Modern standards for climate control developed for new construction may not be achievable or desirable for historic buildings. In each case, the lowest level of intervention needed to successfully accomplish the job should be selected. 1. Determine the use of the building. The proposed use of the building (museum, commercial, residential, retail) will influence the type of system that should be installed. The number of people and functions to be housed in a building will establish the level of comfort and service that must be provided. Avoid uses that require major modifications to significant architectural spaces. What is the intensity of use of the building: intermittent or constant use, special events or seasonal events? Will the use of the building require major new services such as restaurants, laundries, kitchens, locker rooms, or other areas that generate moisture that may exacerbate climate control within the historic space? In the context of historic preservation, uses that require radical reconfigurations of historic spaces are inappropriate for the building. 2. Assemble a qualified team. This team ideally should consist of a preservation architect, mechanical engineer, electrical engineer, structural engineer, and preservation consultants, each knowledgeable in codes and local requirements. If a special use (church, museum, art studio) or a collection is involved, a specialist familiar with the mechanical requirements of that building type or collection should also be hired. Team members should be familiar with the needs of historic buildings and be able to balance complex factors: the preservation of the historic architecture (aesthetics and conservation), requirements imposed by mechanical systems (quantified heating and cooling loads), building codes (health and safety), tenant requirements (quality of comfort, ease of operation), access (maintenance and future replacement), and the overall cost to the owner. 3. Undertake a condition assessment of the existing building and its systems. What are the existing construction materials and mechanical systems? What condition are they in and are they reusable? Where are existing chillers, boilers, air handlers, or cooling towers located? Look at the condition of all other services that may benefit from being integrated into a new system, such as electrical and fire suppression systems. 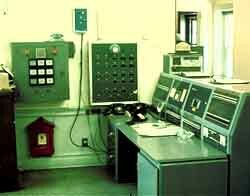 Where can energy efficiency be improved to help downsize any new equipment added, and which of the historic features, e.g. shutters, awnings, skylights, can be reused? Evaluate air infiltration through the exterior envelope; monitor the interior for temperature and humidity levels with hygrothermographs for at least a year. Identify building, site, or equipment deficiencies or the presence of asbestos that must be corrected prior to the installation or upgrading of mechanical systems. 4. Prioritize architecturally significant spaces, finishes, and features to be preserved. Significant architectural spaces, finishes and features should be identified and evaluated at the outset to ensure their preservation. This includes significant existing mechanical systems or elements such as hot water radiators decorative grilles, elaborate switch-plates, and nonmechanical architectural features such as cupolas, transoms, or porches. Identify nonsignificant spaces where mechanical equipment can be placed and secondary spaces where equipment and distribution runs on both a horizontal and vertical basis can be located. Appropriate secondary spaces for housing equipment might include attics, basements, penthouses, mezzanines, false ceiling or floor cavities, vertical chases, stair towers, closets, or exterior below-grade vaults. 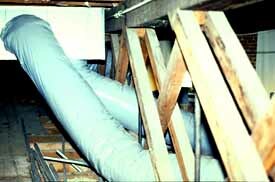 The flexible duct work, seen here, can be used to advantage in tight attic spaces. Photo: NPS files. 5. Become familiar with local building and fire codes. Owners or their representatives should meet early and often with local officials. Legal requirements should be checked; for example, can existing ductwork be reused or modified with dampers? Is asbestos abatement required? What are the energy, fire, and safety codes and standards in place, and how can they be met while maintaining the historic character of the building? How are fire separation walls and rated mechanical systems to be handled between multiple tenants? Is there a requirement for fresh air intake for stair towers that will affect the exterior appearance of the building? Many of the health, energy, and safety code requirements will influence decisions made for mechanical equipment for climate control. It is importance to know what they are before the design phase begins. 6. Evaluate options for the type and size of systems. A matrix or feasibility studies should be developed to balance the benefits and drawbacks of various systems. Factors to consider include heating and/or cooling, fuel type, distribution system, control devices, generating equipment and accessories such as filtration, and humidification. What are the initial installation costs, projected fuel costs, long-term maintenance, and life-cycle costs of these components and systems? Are parts of an existing system being reused and upgraded? The benefits of added ventilation should not be overlooked. What are the tradeoffs between one large central system and multiple smaller systems? Should there be a forced air ducted system, a two-pipe fan coil system, or a combined water and air system? What space is available for the equipment and distribution system? Assess the fire risk levels of various fuels. Understand the advantages and disadvantages of the various types of mechanical systems available. Then evaluate each of these systems in light of the preservation objectives established during the design phase of planning. Water systems are generally called hydronic and use a network of pipes to deliver water to hot water radiators, radiant pipes set in floors or fan coil cabinets which can give both heating and cooling. Boilers produce hot water or steam; chillers produce chilled water for use with fan coil units. Thermostats control the temperature by zone for radiators and radiant floors. A fan coil unit in the basement is feeding controlled air to a primary space upstairs. Photo: Courtesy, Karen Sweeney, Frank Lloyd Wright Home & Studio. Fan coil units have individual controls. Radiant floors provide quiet, even heat, but are not common. Advantages: Piped systems are generally easier to install in historic buildings because the pipes are smaller than ductwork. Disadvantages: There is the risk, however, of hidden leaks in the wall or burst pipes in winter if boilers fail. Fan coil condensate pans can overflow if not properly maintained. Fan coils may be noisy. Radiators or baseboard radiators are looped together and are usually set under windows or along perimeter walls. New boilers and circulating pumps can upgrade older systems. Most piping was cast iron although copper systems can be used if separately zoned. Modern cast iron baseboards and copper fin-tubes are available. 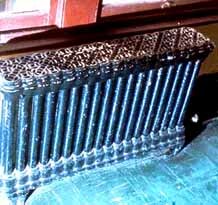 Historic radiators can be reconditioned. 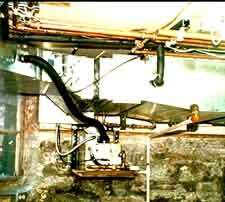 Fan coil systems use terminal cabinets in each room serviced by 2, 3, or 4 pipes approximately 11/2" each in diameter. A fan blows air over the coils which are serviced by hot or chilled water. Each fan coil cabinet can be individually controlled. Four-pipe fan coils can provide both heating and cooling all year long. Most piping is steel. Non-cabinet units may be concealed in closets or custom cabinetry, such as benches, can be built. The basic heating, ventilation and air conditioning (HVAC) system is all-air, single zone fan driven designed for low, medium or high pressure distribution. The system is composed of compressor drives, chillers, condensers, and furnace depending on whether the air is heated, chilled or both. Condensers, generally air cooled, are located outside. The ducts are sheet metal or flexible plastic and can be insulated. Fresh air can be circulated. Registers can be designed for ceilings, floors and walls. The system is controlled by thermostats; one per zone. Advantages: Ducted systems offer a high level of control of interior temperature, humidity, and filtration. Zoned units can be relatively small and well concealed. Disadvantages: The damage from installing a ducted system without adequate space can be serious for a historic building. Systems need constant balancing and can be noisy. Most residential or small commercial systems will consist of a basic furnace with a cooling coil set in the unit and a refrigerant compressor or condenser located outside the building. Heating and cooling ductwork is usually shared. If sophisticated humidification and dehumidification is added to the basic HVAC system, a full climate control system results. This can often double the size of the equipment. The heat pump is a basic HVAC system as described above except for the method of generating hot and cold air. The system operates on the basic refrigeration cycle where latent heat is extracted from the ambient air and is used to evaporate refrigerant vapor under pressure. Functions of the condenser and evaporator switch when heating is needed. Heat pumps, somewhat less efficient in cold climates, can be fitted with electric resistance coil. These systems are popular for restoration work because they combine the ease of installation for the piped system with the performance and control of the ducted system. Smaller air handling units, not unlike fan coils, may be located throughout a building with service from a central boiler and chiller. In many cases the water is delivered from a central plant which services a complex of buildings. This system overcomes the disadvantages of a central ducted system where there is not adequate horizontal or vertical runs for the ductwork. The equipment, being smaller, may also be quieter and cause less vibration. If only one air handler is being utilized for the building, it is possible to house all the equipment in a vault outside the building and send only conditioned air into the structure. Advantages: flexibility for installation using greater piping runs with shorter ducted runs; Air handlers can fit into small spaces. Disadvantages: piping areas may have undetected leaks; air handlers may be noisy. Non-systems components should not be overlooked if they can make a building more comfortable without causing damage to the historic resource or its collection. Installing a fan (successfully concealed here) for increased ventilation can be a successful low-tech substitute for air conditioning. Photo: Courtesy, Shelburne Village. Advantages: components may provide acceptable levels of comfort without the need for an entire system. Disadvantages: Spot heating, cooling and fluxuations in humidity may harm sensitive collections or furnishings. If an integrated system is desirable, components may provide only a temporary solution. Most individual air conditioners are set in windows or through exterior walls which can be visually as well as physically damaging to historic buildings. Newer portable air conditioners are available which sit in a room and exhaust directly to the exterior through a small slot created by a raised window sash. Fans should be considered in most properties to improve ventilation. Fans can be located in attics, at the top of stairs, or in individual rooms. In moderate climates, fans may eliminate the need to install central air systems. For houses without central air handling systems, a dehumidifier can resolve problems in humid climates. Seasonal use of dehumidifiers can remove moisture from damp basements and reduce fungal growth. Portable radiant heaters, such as those with water and glycol, may provide temporary heat in buildings used infrequently or during systems breakdowns. Care should be taken not to create a fire hazard with improperly wired units. In designing a system, it is important to anticipate how it will be installed, how damage to historic materials can be minimized, and how visible the new mechanical system will be within the restored or rehabilitated spaces. Mechanical equipment space needs are often overwhelming; in some cases, it may be advantageous to look for locations outside of the building, including ground vaults, to house some of the equipment but only if it there is no adverse impact to the historic landscape or adjacent archeological resources. Various means for reducing the heating and cooling loads (and thereby the size of the equipment) should be investigated. This might mean reducing slightly the comfort levels of the interior, increasing the number of climate control zones, or improving the energy efficiency of the building. 1. Establish specific criteria for the new or upgraded mechanical system. New systems should be installed with a minimum of damage to the resource and should be visually compatible with the architecture of the building. They should be installed in a way that is easy to service, maintain, and upgrade in the future. There should be safety and backup monitors in place if buildings have collections, computer rooms, storage vaults or special conditions that need monitoring. The new systems should work within the structural limits of the historic building. They should produce no undue vibration, no undue noise, no dust or mold, and no excess moisture that could damage the historic building materials. If any equipment is to be located outside of the building, there should be no impact to the historic appearance of building or site, and there should be no impact on archeological resources. 2. Prioritize the requirements for the new climate control system. The use of the building will determine the level of interior comfort and climate control. Sometimes, various temperature zones may safely be created within a historic building. This zoned approach may be appropriate for buildings with specialized collections storage, for buildings with mixed uses, or for large buildings with different external exposures, occupancy patterns, and delivery schedules for controlled air. Special archives, storage vaults or computer rooms may need a completely different climate control from the rest of the building. Determine temperature and humidity levels for occupants and collections and ventilation requirements between differing zones. Establish if the system is to run 24 hours a day or only during operating or business hours. Determine what controls are optimum (manual, computer, preset automatic, or other). The size and location of the equipment to handle these different situations will ultimately affect the design of the overall system as well. This radiator would be identified as a significant element of the interior. In any work to upgrade the mechanical system, it would be retained and preserved, even if non-functioning. Photo: NPS files. 3. Minimize the impact of the new HVAC on the existing architecture. Design criteria for the new system should be based on the type of architecture of the historic resource. Consideration should be given as to whether or not the delivery system is visible or hidden. Utilitarian and industrial spaces may be capable of accepting a more visible and functional system. More formal, ornate spaces which may be part of an interpretive program may require a less visible or disguised system. A ducted system should be installed without ripping into or boxing out large sections of floors, walls, or ceilings. A wet pipe system should be installed so that hidden leaks will not damage important decorative finishes. In each case, not only the type of system (air, water, combination), but its distribution (duct, pipe) and delivery appearance (grilles, cabinets, or registers) must be evaluated. It may be necessary to use a combination of different systems in order to preserve the historic building. Existing chases should be reused whenever possible. 4. Balance quantitative requirements and preservation objectives. The ideal system may not be achievable for each historic resource due to cost, space limitations, code requirements, or other factors beyond the owner's control. However, significant historic spaces, finishes, and features can be preserved in almost every case, even given these limitations. For example, if some ceiling areas must be slightly lowered to accommodate ductwork or piping, these should be in secondary areas away from decorative ceilings or tall windows. If modern fan coil terminal units are to be visible in historic spaces, consideration should be given to custom designing the cabinets or to using smaller units in more locations to diminish their impact. If grilles and registers are to be located in significant spaces, they should be designed to work within the geometry or placement of decorative elements. All new elements, such as ducts, registers, pipe-runs, and mechanical equipment should be installed in a reversible manner to be removed in the future without further damage to the building. Once the system is installed, it will require routine maintenance and balancing to ensure that the proper performance levels are achieved. In some cases, extremely sophisticated, computerized systems have been developed to control interior climates, but these still need monitoring by trained staff. A sprinkler system is unobtrusively placed behind a false cornice at the end of a corridor. Photo: NPS files. If collection exhibits and archival storage are important to the resource, the climate control system will require constant monitoring and tuning. Backup systems are also needed to prevent damage when the main system is not working. The owner, manager, or chief of maintenance should be aware of all aspects of the new climate control system and have a plan of action before it is installed. Regular training sessions on operating, monitoring, and maintaining the new system should be held for both curatorial and building maintenance staff. If there are curatorial reasons to maintain constant temperature or humidity levels, only individuals thoroughly trained in how the HVAC systems operates should be able to adjust thermostats. Ill-informed and haphazard attempts to adjust comfort levels, or to save energy over weekends and holidays, can cause great damage. 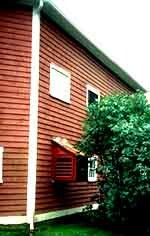 Use shutters, operable windows, porches, curtains, awnings, shade trees and other historically appropriate nonmechanical features of historic buildings to reduce the heating and cooling loads. Consider adding sensitively designed storm windows to existing historic windows. Retain or upgrade existing mechanical systems whenever possible: for example, reuse radiator systems with new boilers, upgrade ventilation within the building, install proper thermostats or humidistats. Improve energy efficiency of existing buildings by installing insulation in attics and basements. Add insulation and vapor barriers to exterior walls only when it can be done without further damage to the resource. In major spaces, retain decorative elements of the historic system whenever possible. This includes switch-plates, grilles and radiators. Be creative in adapting these features to work within the new or upgraded system. Use space in existing chases, closets or shafts for new distribution systems. Design climate control systems that are compatible with the architecture of the building: hidden system for formal spaces, more exposed systems possible in industrial or secondary spaces. In formal areas, avoid standard commercial registers and use custom slot registers or other less intrusive grilles. Size the system to work within the physical constraints of the building. Use multi-zoned smaller units in conjunction with existing vertical shafts, such as stacked closets, or consider locating equipment in vaults underground, if possible. 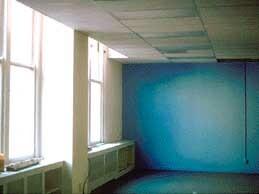 Provide adequate ventilation to the mechanical rooms as well as to the entire building. 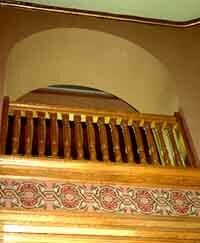 Selectively install air intake grilles in less visible basement, attic, or rear areas. Maintain appropriate temperature and humidity levels to meet requirements without accelerating the deterioration of the historic building materials. Set up regular monitoring schedules. Design the system for maintenance access and for future systems replacement. For highly significant buildings, install safety monitors and backup features, such as double pans, moisture detectors, lined chases, and battery packs to avoid or detect leaks and other damage from system failures. Have a regular maintenance program to extend equipment life and to ensure proper performance. Train staff to monitor the operation of equipment and to act knowledgeably in emergencies or breakdowns. Have an emergency plan for both the building and any curatorial collections in case of serious malfunctions or breakdowns. Don't install a new system if you don't need it. Don't switch to a new type of system (e.g. forced air) unless there is sufficient space for the new system or an appropriate place to put it. Don't over-design a new system. Don't add air conditioning or climate control if they are not absolutely necessary. Don't cut exterior historic building walls to add through-wall heating and air conditioning units. These are visually disfiguring, they destroy historic fabric, and condensation runoff from such units can further damage historic materials. Don't damage historic finishes, mask historic features, or alter historic spaces when installing new systems. Don't drop ceilings or bulkheads across window openings. Don't remove repairable historic windows or replace them with inappropriately designed thermal windows. Don't seal operable windows, unless part of a museum where air pollutants and dust are being controlled. Don't place condensers, solar panels, chimney stacks, vents or other equipment on visible portions of roofs or at significant locations on the site. Don't overload the building structure with the weight of new equipment, particularly in the attic. Don't place stress on historic building materials through the vibrations of the new equipment. Don't allow condensation on windows or within walls to rot or spall adjacent historic building materials. Maintenance staff should learn how to operate, monitor, and maintain the mechanical equipment. They must know where the maintenance manuals are kept. Routine maintenance schedules must be developed for changing and cleaning filters, vents, and condensate pans to control fungus, mold, and other organisms that are dangerous to health. Such growths can harm both inhabitants and equipment. (In piped systems, for example, molds in condensate pans can block drainage lines and cause an overflow to leak onto finished surfaces). Maintenance staff should also be able to monitor the appropriate gauges, dials, and thermographs. Staff must be trained to intervene in emergencies, to know where the master controls are, and whom to call in an emergency. As new personnel are hired, they will also require maintenance training. In addition to regular cyclical maintenance, thorough inspections should be undertaken from time to time to evaluate the continued performance of the climate control system. As the system ages, parts are likely to fail, and signs of trouble may appear. Inadequately ventilated areas may smell musty. Wall surfaces may show staining, wet patches, bubbling or other signs of moisture damage. Routine tests for air quality, humidity, and temperature should indicate if the system is performing properly. If there is damage as a result of the new system, it should be repaired immediately and then closely monitored to ensure complete repair. Equipment must be accessible for maintenance and should be visible for easy inspection. Moreover, since mechanical systems last only 15-30 years, the system itself must be "reversible." That is, the system must be installed in such a way that later removal will not damage the building. In addition to servicing, the backup monitors that signal malfunctioning equipment must be routinely checked, adjusted, and maintained. Checklists should be developed to ensure that all aspects of routine maintenance are completed and that data is reported to the building manager. plan for the future removal or replacement of the system. Too often the presumed climate needs of the occupants or collections can be detrimental to the long-term preservation of the building. With a careful balance between the preservation needs of the building and the interior temperature and humidity needs of the occupants, a successful project can result. The author gratefully acknowledges the invaluable assistance of Michael C. Henry, P.E., AIA, in the development and technical editing of this Preservation Brief. Technical review was also provided by Ernest A. Conrad, P.E. Thanks is also given to staff members of the National Park Service Cultural Resources Programs, including Tom Keohan and Catherine Colby, Rocky Mountain Region; Michael Crowe, Western Region; Mark Chavez, Midwest Region; Randall J. Biallas, AIA, Chief, Park Historic Architecture Division, and George A. Thorsen, Historical Architect, Denver Service Center. Special thanks is also given to Michael J. Auer of Technical Preservation Services for his editorial assistance in preparing this paper and Tim Buehner for his assistance with the illustrations. Banham, Reyner. The Architecture of the Well-Tempered Environment. London: The Architectural Press, 1969. Burns, John A., AIA. Energy Conserving Features Inherent in Older Homes. Washington: U.S. Department of Housing and Urban Development and U.S. Department of the Interior, 1982. Cowan, Henry J. Science and Building: Structural and Environmental Design in the Nineteenth and Twentieth Centuries. New York: John Wiley and Sons, 1978. Ferguson, Eugene S. "An Historical Sketch of Central Heating: 1800-1860," in Building Early America (Charles Peterson, editor) Philadelphia: Chilton Book Co., 1976. Fitch, James Marston. American Building: The Environmental Forces That Shape It. Boston: Houghton-Mifflin Co., 1972. Giedion, Siegfried. Mechanization Takes Command—a Contribution to Anonymous History. New York: Oxford University Press, 1948. Merritt, Frederick S. Building Engineering and Systems Design. New York: Van Nostrand Reinhold Co, 1979. Smith, Baird M. Preservation Briefs 3: Conserving Energy in Historic Buildings. Washington, DC: U.S. Department of the Interior, 1978. Turberg, Edward. A History of American Building Technology. Durham: Durham Technical Institute, 1981.